Textile weaving is not commonly associated with fine art. Manually crafting fiber from the loom into fabric is a historic practice of more primitive cultures employed for practical ends, as opposed to bold, artistic expression. The works by John Hess, whose Woven Textile Reliefs are on display at Art Access Gallery, are handcrafted, visually bold and inventively expressive examples of fine art. Hess cuts no corners, and works from the ground up in his creation of woven art objects. 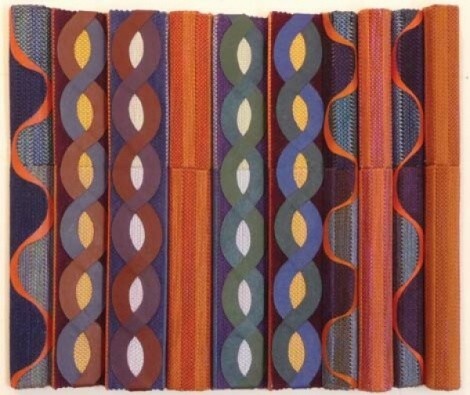 His forms are the product of hand weaving, produced on two looms—one traditional, and one with computer-programmed design with manual operation. Hess combines many weaving methods on the looms when he creates his textile reliefs. These are in essence 3-D canvases that use fabric instead of paint for their motifs. Hess frequently incorporates other materials, such as a strip of metal, to give these canvases even more visual appeal. The results are lively, whimsical and fun. Although Hess is a Caucasian male creating contemporary art using contemporary technologies, the tradition and origins of his craft cannot be overlooked, harkening to ancient and primitive cultures that developed these techniques. One might see patterns and motifs reminiscent of American Indians in Hess’ canvases, or African tribal abstract geometry. Hess has taken an ancient and pragmatic practice and now uses it for its own sake, for its pure aesthetic value as fine art, pushing the limits of its aesthetic possibility.